You are here: Home >Special > **Special Tahiti Cruise, Air & Hotel Package - 8 Days From $3799 US! **Special Tahiti Cruise, Air & Hotel Package - 8 Days From $3799 US! Windstar Cruises welcomes you to paradise! Come enjoy the crystal-blue waters of Tahiti as your sail with Wind Spirit to six islands. Our Free Air + Hotel Package has you depart from Los Angeles and set foot in Tahiti in only eight hours. You'll then step aboard Wind Spirit, a luxury yacht that takes you to the most serene destinations in French Polynesia. Experience intimate harbors, crystal-clear coves, and pristine white sands. Hop ashore to the enchanted landscapes of Moorea, or explore Raiatea's lush forests and black pearl farms. Melt into the warm lagoons surrounding the exquisite peaks of Bora Bora. Relax on board as your yacht glides into small bays other cruise ships can't reach and drops anchor in shallow waters teeming with schools of tropical fish. Jump into a beautiful palm-fringed lagoon from the Watersports Platform. Or simply unwind on deck, enjoying paradise and endless pampering. This is how Tahiti was meant to be seen, join us! Take advantage of our special offer and find bliss amongst the many islands of Tahiti. All you need to do is relax and we'll take care of all the rest. See more of Tahiti on the World's Best Small Ship Cruise Line! Fly from Los Angeles to Papeete, Tahiti and overnight at Le Meridien Resort Tahiti. Enjoy your day at Le Meridien Resort Tahiti. This afternoon you'll transfer to the Wind Spirit where you'll enjoy a 7 night cruise. Disembark the Wind Spirit this morning and enjoy your day at Le Meridien Resort Tahiti. This evening you'll depart Papeete by air. Arrive into Los Angeles this morning. See the best of Tahiti in seven days. Lush harbours. Crystal coves. Pristine white beaches. A welcoming tropical paradise awaits. There's no better way to explore the island nation of Tahiti than being aboard your own graceful sailing yacht - Polynesian tradewinds carrying you from one natural beauty to another. Embark on drift snorkeling excursions among coral gardens in Tahaa. Explore the majestic palm-fringed Three Coconut Trail in Moorea. And indulge in Bora Bora's kaleidoscope of colored seas and stunning white-sand beaches. Complimentary Event - Bora Bora Private Celebration! On each Tahiti cruise, Windstar will include a private event on Bora Bora - a Celebration Festival complete with dinner and entertainment! Bora Bora is surrounded by a number of tiny islets called "motu" - and you will spend the evening on a secluded motu accompanied only by other Windstar guests. You will be welcomed to the motu with a traditional flower lei. Your private feast on the beach promises to be extraordinary. Tender suckling pig will be slowly steamed in a traditional "ahima'a," a Tahitian earth oven. The oven is preheated with a wood fire. Then porous volcanic rock is scattered over the wood until it is completely covered. When the fire goes out, the rocks are leveled and the pig placed on top. Banana leaves are laid over the top to cover the ahima'a completely. Finally, earth is shoveled on top so no heat escapes and the pig cooks for up to four hours until the meat is so tender it almost melts in your mouth. Raiatea, known as The Sacred Island, is located just across the lagoon from Taha'a and shares the same barrier reef. (Legend claims the two were a single island until a conger eel possessed by the spirit of a princess separated them.) It used to be the center of religion and culture in the Society Islands. Taputapuatea, on the southeast coast, was once the most important marae around, the place where kings from the neighboring islands would gather for important ceremonies. Uturoa, the main town, reminds some people of Papeete in its younger days with its quaint low-rise buildings. Raiatea is also home to the only navigable river in the islands, the Fa'aroa. Explore Polynesian history or climb Mount Temehani in search of the rare tiare apetahi flower, which grows only here. 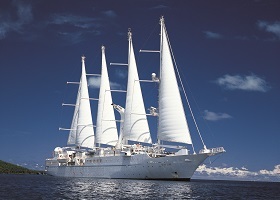 The Wind Spirit is a sleek, four-masted sailing yacht accommodating 148 guests. With four decks and a gross tonnage of 5,350, the Wind Spirit feels like your own private yacht. Wind Spirit features wide open, teak decks - quite unusual for small ships. With over 10,000 square feet of open deck space, guests will find hidden nooks for private moments giving them a feeling of being on their own private verandah. All staterooms have ocean views, queen beds, flat-screen TV with DVD player and Bose SoundDock speakers for Apple iPods. The Owner's Suite includes a sitting area. Wind Spirit offers two primary dining venues. The Restaurant offers gourmet, course-by-course cuisine in the evenings and the Veranda restaurant offers casual buffet and full-service dining for breakfast and lunch. All dining is open seating. And, for dining under the stars, make a reservation for Candles which features steaks and skewers. Wind Spirit amenities WindSpa, casino and entertainment lounge, water-sports platform, library, pool and hot tub. All pricing above is in US Dollars, per person. Port charges & taxes are additional. Pricing is based on two people sharing and subject to availability. The "From" price listed on our website is for the December 13th departure date; other dates may have different pricing, please inquire. 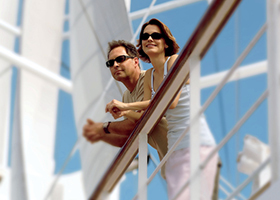 All pricing is based on availability and subject to change by the cruise line at any time. Windstar Cruises free airfare & hotel package from Los Angeles requires booking a minimum of 60 days prior to the cruise departure date and the package is based on space availability. For more information please contact one of our Tahiti Specialists!